If you’re a young lady graduating from high school, and have a best friend is going away to college, you might think about giving her a personalized gift that she can take with her. Even better if you are an artist who can illustrate your past adventures or a writer who can put together poems about the most memorable days you spent with your sidekick. If you are not an artistic person, but still want to give your friend a creative piece of yourself, Nikki Roddy’s book, “Take Me with You,” will spare you the trouble of brainstorming for great ideas. A book has always been considered a great present, as long as you know what a person likes to read. “Take Me with You” is not only for reading, though. 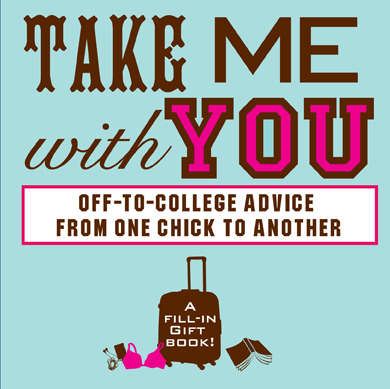 Giving funny advice about what to take to college, how to study, how to party safely and enjoyably and many other things a young girl starting her independent life may need to know, the book leaves spaces for you and your friend to fill in. You can write about activities you liked to do in high school, insert pictures or notes that you passed during classes, or give your own pieces of advice. Reading what was in the book and what you wrote, your friend will go through 96 pages of valuable memories you shared with her and come across various notes of appreciation. As far as the structure is concerned, “Take Me with You” is divided into seven chapters and each of them starts with an amusing quote. Throughout the book, you will have blanks to fill in and words that you will circle. In some chapters, there are inside jokes that you will remind your friend of, while in others, there are pages for pictures and comments, or tables with information. Imagine a compressed combination of a yearbook, an album and a guidebook. This is what “Take Me with You” can be briefly described as. Even though it outlines the main things you should advise your friend to do, it allows you to be creative and make your present personalized, so that even if both you and your friend pick up “Take Me with You” for each other, they will not be the same. The size of the book matters as well. “Take Me with You” is so little that it will fit into smallest purses, not mentioning a suitcase your friend bought for her trip to college: it will not add any extra weight to her luggage. Moreover, she may want to carry it with her to college, so that she can laugh at some funniest moments of your past during especially boring classes. The only thing you should know is that if you decide to purchase the book, you will need some time to collect pictures, think of the most applicable advice and make it as interesting as possible. Let your personality shine from the standardized pages: shouldn’t special friends give special presents? This book allows that to occur.